Geeks of all sizes tend to enjoy games, but the trick is finding games that everyone can play together and enjoy. Many games aimed at children consist of rolling a die (or flicking a spinner) and moving, which can get pretty old before too long. Why not look for games with mechanics simple enough for the younger geeklings to grasp, but still allow for a bit of choice in what the player does each time? Last time, I focused on games that are aimed toward the younger set. 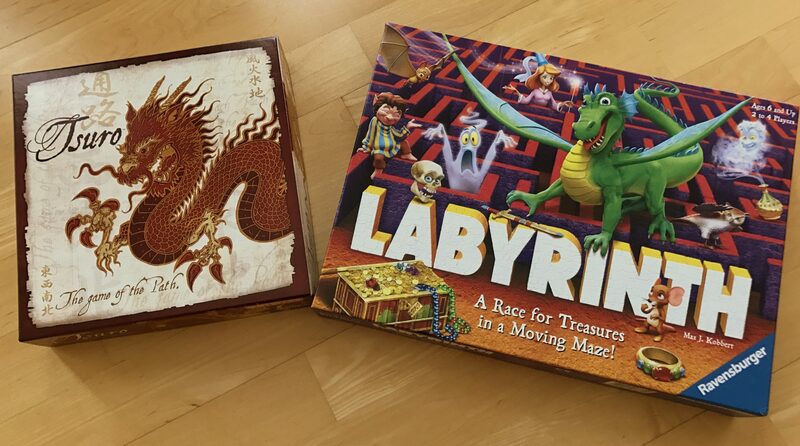 Today, I’ll be talking about two games that involve twisting and turning: Tsuro and Labyrinth (not to be confused with the Labyrinth board game based on the film of the same name, as recently covered on this site). Both are designed to be true “family games,” simple enough to be played by all ages while still being enjoyable. Tsuro, published by Calliope Games (previously WizKids), and Labyrinth, by Ravensburger. First, it must be simple enough for a young child to play. If you can’t explain the game to a three-, four-, or five-year-old in five minutes, it may be too complicated. Second, the game must not require reading. Geeklings level up at different rates, and while some may choose to put their XP into a written language skill, most wait. Third, the game must require the player to do more than simply roll a die (or spin a spinner, draw a card, etc.) and move their piece. The player making decisions must be a part of gameplay. 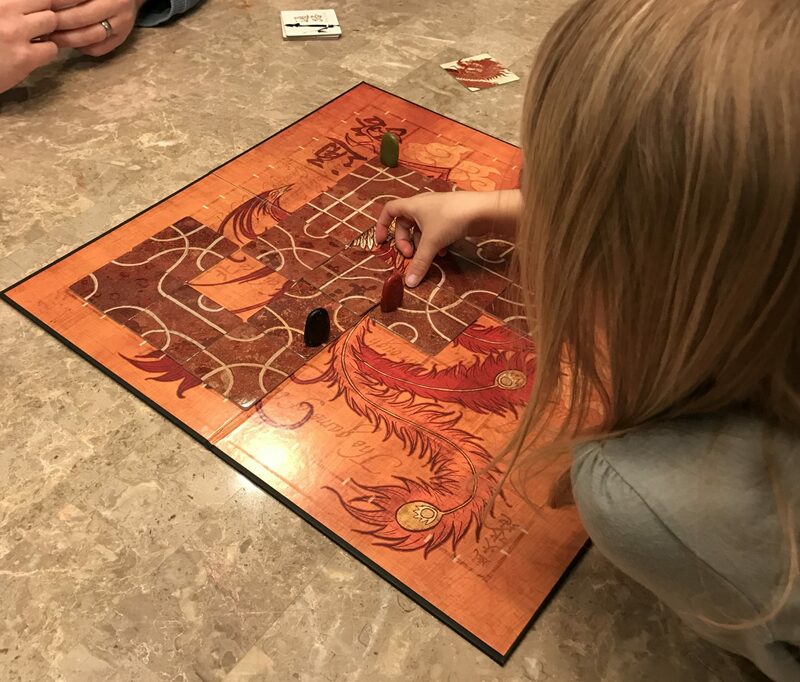 Tsuro is a game that involves moving your piece along a path you create, with the catch being that the other players ultimately affect where your path leads. The more people playing, the less control you have over where you wander—and since the game can have up to eight people playing, things can get pretty chaotic. The goal of the game is pretty simple: be the last player left wandering the paths. There are two ways you could be eliminated, namely by wandering off the game board or by crashing into another person (which removes both players involved in the crash). Tiny people tend to find things crashing into one another to be the height of hilarity, which makes this game geekling friendly—it’s nice when the loss of a game is met with giggles instead of tears. 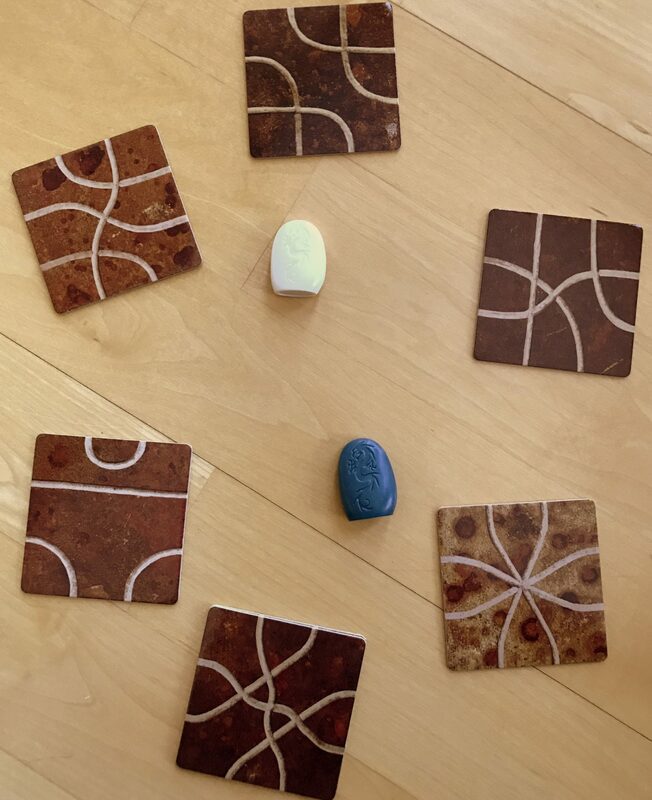 Path tiles and player tokens. So, where to find it? Chances are good that your local board-game store has a few copies, and it may be possible to find a copy at some bookstores. And of course, there’s always Amazon. Tsuro is published by Calliope Games, and the rule book is available on Calliope’s website. A variation, Tsuro of the Seas, is also available. We haven’t played it yet, but I wouldn’t be surprised if it makes it into our game vault sooner rather than later. 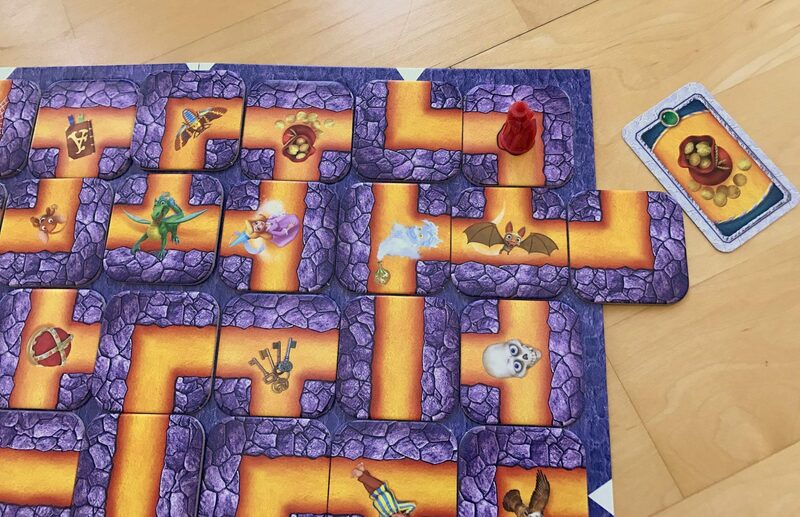 Labyrinth is great for your maze-obsessed kid (or Minotaur). It was one of my favorites growing up, so I was thrilled when I stumbled across a copy on clearance. Fortunately, my kidlet enjoys mazes as much as her momma did at that age, so it’s become part of our arsenal of kid-friendly games. The labyrinth, all ready for gameplay to start. In this game, you move through an ever-shifting labyrinth, trying to be the first player to find all your treasures and return to your starting spot. Gameplay is pretty simple, too. At the beginning of the game you’re dealt the treasures you need to find; on your turn, you insert a tile into the labyrinth to shift the walls, then you move your piece to (or as close as you can get) to the next treasure you need to find. If Red pushes in the tile, they can get to their goal. Of course, while the gameplay is simple, the strategy can be challenging, since the maze is always changing. A clear path that was present on your last turn may not be available on your next. The game’s rule book has some tips on simplifying the game for younger kids, such as having a public pool of treasure cards. We’ve had good luck with letting our kiddo pick which of her treasure cards she wants to pursue next (all other players can only look at one treasure card at a time) and reducing the number of treasure cards each player has in their hand (to keep the game within her attention span). On a side note, let’s give Labyrinth a moment of appreciation for it’s well-designed game box. All of the pieces fit back into their own spots, making getting them back in there (and seeing whether all of the pieces did make it back in) really easy. Look! The pieces fit! Neatly! 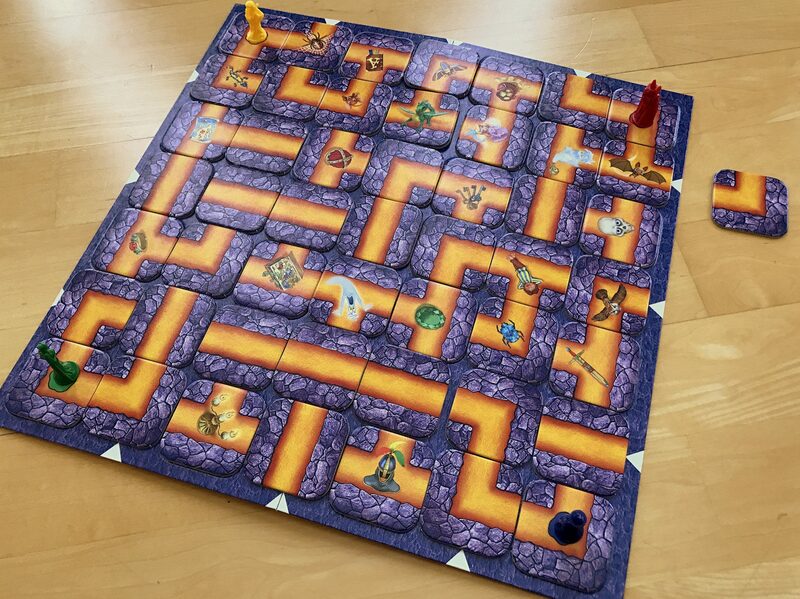 Labyrinth is published by Ravensburger and is playable by two to four people. 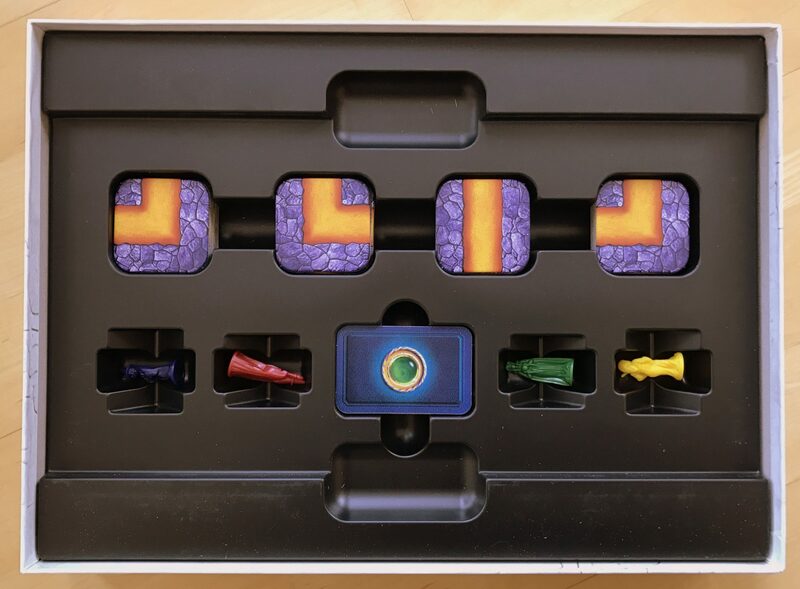 The recommended ages vary based on where you look—the website says eight and up, the game box says six and up—but we’ve had success with our five-year-old using the modifications mentioned above. More information, including game rules, can be found on Ravensburger’s website. Do you have a game that’s worked especially well in your family’s game nights? Mention it in the comments! Any suggestions about the rules for the gameplay of Nihilist Tsuro are also welcome.